Like many others, I take this season to reflect on the year, especially things that have given me joy. While there have been a number of personal and professional landmarks in my year, at the top of the list is undoubtedly my whirlwind trip to Uganda in October as a CROSO ‘Ambassador’. Elsa with CROSO Scholars at a full-day gathering in Kampala where nearly all 22 current scholars attended. 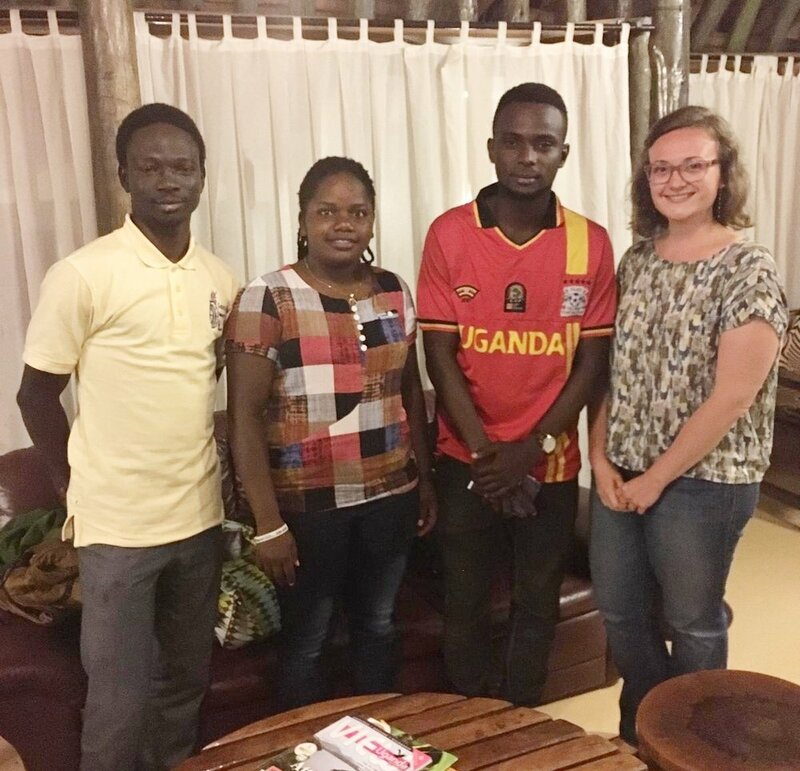 It can be difficult to know someone only from email, so by far my favorite part of visiting Uganda was spending time with our scholars and graduates. Over and again I was struck by our scholars’ warm welcomes and hugs and their eagerness to show me their campuses and describe their classes. It was often so easy to fall into deep conversation with our scholars. We at CROSO tend to focus on their academic situations, but I think fondly of our animated conversations on all subjects, ranging from finals and internships to politics, movies and TV (we can all agree that Black-ish is hilarious), and the complex process of a ‘traditional’ Ugandan wedding. Elsa with 3 CROSO Graduates - Gabriel, Norah, and Raymond. I also met Lochole Moses and Khatuli Raymond, with whom I wrote as part of the CROSO Liaison Program. Digital communication is so easy now that it felt unusual to be awkwardly shaking hands with people I felt so connected with, then almost instantly we fell into stories of Moses’ job search, and of Raymond’s side projects and family. While visiting C.R.O. in Mbale to see where our scholars restart their academic careers, I was taken by just how deeply the staff at C.R.O. loves and cares for all the C.R.O. children. Of course we have heard this. But seeing the C.R.O. staff interacting with the children and hearing the pride in their voices when they talk about the CROSO graduates gives this a deeper meaning. During my first morning at C.R.O., the social workers at C.R.O. explained to me the complex and nuanced factors leading to the problem of street children in Uganda (not unlike those leading to poverty in the US). They also told me about the whole-child approach C.R.O. services provides. At the end of our meeting, the social workers genuinely thanked me for coming to C.R.O. and listening with an open mind and heart. However, I am most thankful for C.R.O. and for their work in pushing our scholars to achieve great things. It is because of the care of the C.R.O. staff that these students eventually become our scholars. From the moment I arrived at the Entebbe airport on Sunday morning at 3:30am to the moment I was dropped off at the Entebbe airport on Saturday at midnight, I was always made to feel welcome and cared for. Not only by the C.R.O. staff and our scholars, but also by everyone I came into contact with while in Uganda. Because it doesn’t have the same level of tourism as neighboring countries, we tend to overlook just how friendly and welcoming Uganda is (and it’s beautiful! Go visit!). I am so thankful for my drivers Johnny and Felix, who not only helped me navigate the cities, but also Ugandan culture, politics, and the economy. And they made sure I tried yummy Ugandan snacks, too. Having volunteered with CROSO for nearly five years now, I knew I would like to meet our scholars in person at some point, but the logistics of such a long trip around the world made this reality far off. So for that I am grateful for the people who helped me take this opportunity. Specifically, I am thankful for the family that taught me the value of volunteering and community engagement. I am thankful for my partner and friends who encourage my passions. I am thankful to work at a company that understands the importance of a life outside work and didn’t blink an eye when I asked for a week off work during my first six months after starting a new job. Attendees at the 2018 CROSO Benefit raising their paddles in support of our CROSO Scholars. Lastly, I am thankful for the CROSO community of donors, volunteers, and all-around cheerleaders who believe in our students as much as we do. There was a moment at our annual benefit in October during the paddle raise when it seemed like every paddle in the room was in the air, offering financial support. For me, who joined this organization when we could support only a small handful of students, this moment at the benefit was a breathtaking confirmation of CROSO’s work and of our students. This week, as I tuck into my plate full of turkey and casseroles, I’ll take a moment to show gratitude for everything that CROSO has given to me, for the community that supports it, and for the scholars and graduates that daily do their parts to make the world a better place too.